I'm not going to lie. I am amazed that I got this chance. I did everything in my power to not be an idiot. I think I succeeded. So what's it like to be in the press box during a game? It looks like a pressure packed situation, I know. But it really isn't. Social media is the biggest difference now. The writers all tweet out the lineup pregame. It's almost a contest to see who gets it out first. I avoided it. I mean, I had barely gotten there when the lineups came out. Why repeat what you alll saw already? 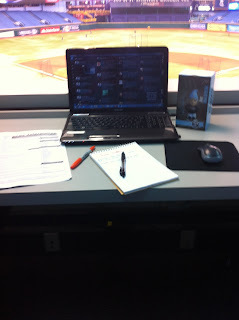 After I collected all the stat sheets that are laid out for the media, I finally settled in. My computer was plugged in and my iphone was fully charged. There are certain spots on the tables for visiting media. It's basically 3 long counters. I sat at the 3rd one. The top. I mean, who am I to get front a row seat? So i took the top. There was a family with 2 girls ages 12 & 8 sitting next to me pre game. The 8 year old thought it was funny that we both were in the press box for the first time. Who knows? She may be there again before me. But I digress. So a little after BP starts is the dugout chat with Joe Maddon. 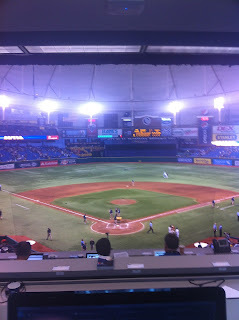 The Rays are the home team and take BP first. I took the elevator down, walked through a tunnel, and emerged on the field. I just stood there for a moment and soaked it all up. The last time I was on a Major League field was a picture day at Wrigley when I was a kid. 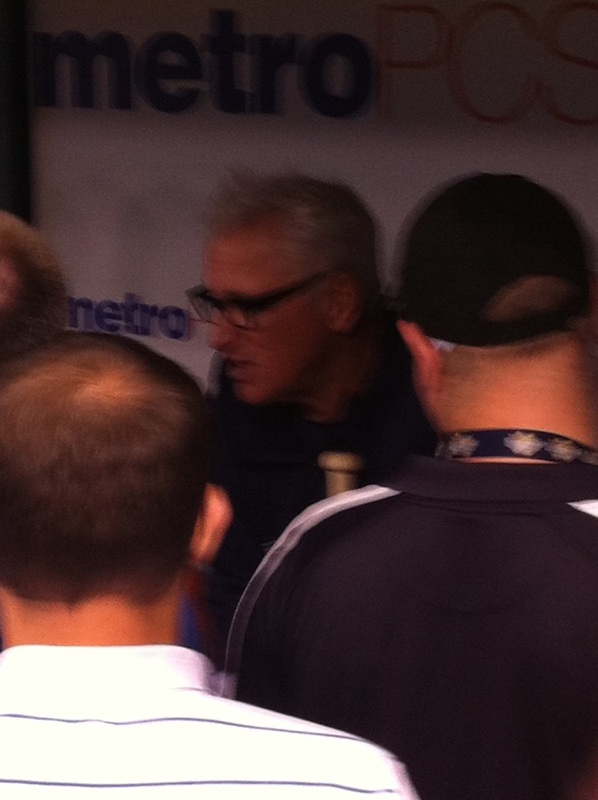 I spent Maddon's pre game talk outside the dugout. I didn't hear much of what he said at all. But at that moment I thought it was cool to listen to a big league manager. 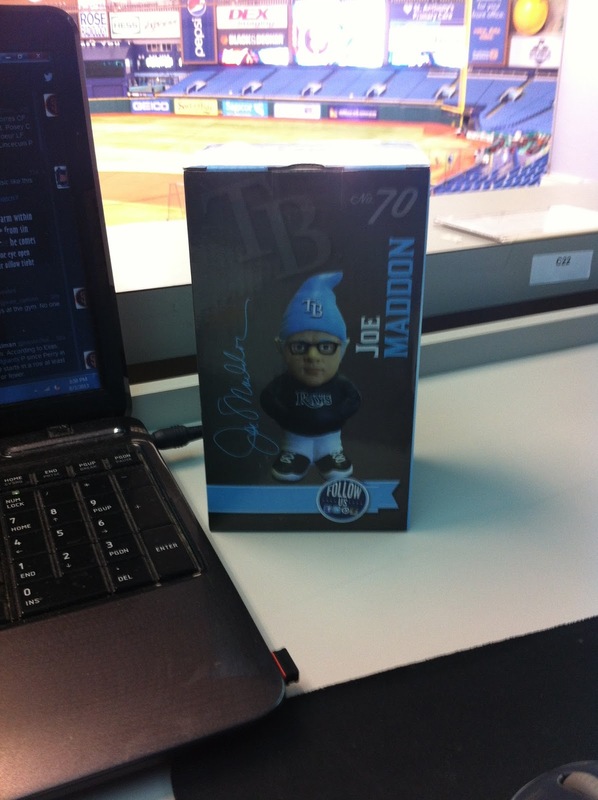 Shortly after Joe Maddon talked to us the Rays were done hitting, That's when I had to hold the line between fangirl and journalist. The Giants players streamed out of the clubhouse right past me. I had to keep it together. 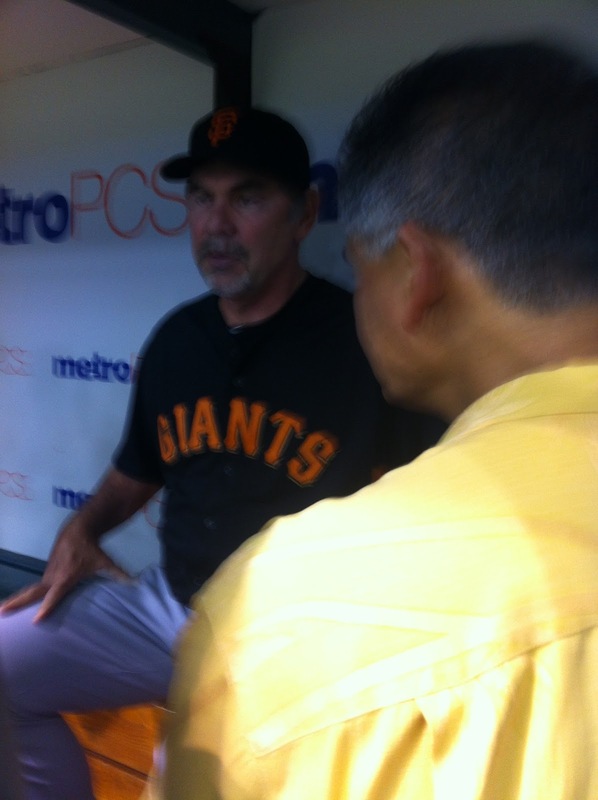 I was in the dugout for Bochy's pregame media gathering. I learned a little bit. Everyone on the active roster is healthy according to Bochy. He told us the staff has not considered September call ups yet. Don't be shocked if Gary Brown gets called up in September. Hunter Pence put on a show in BP. The Rays fans ooohed and aaahed his deep bombs. He even hit the digital ad board above the LF bleachers. Was a good 450 feet away. As I stood in the Giants dugout for BP I was able to talk to some different guys. The first man on the Giants staff that I talked with was Tim Flannery. He was awesome. We stood there and talked about music for 10 minutes or so. It was the perfect way for me to feel comfortable. I was so worried about talking to any of the guys, and it took a short conversation about music to put me at ease. After a while I found myself standing there all alone with Brian Sabean. I shared with him the story of how I once was a server at a restaurant and had served his In-laws. We talked about that and then moved on to other things. I'll be honest, we talked about some personal things. It was 5 minutes of my life I will never forget. There was nothing down on the field that would top that for me. So I decided to wander around the park and check some things out. 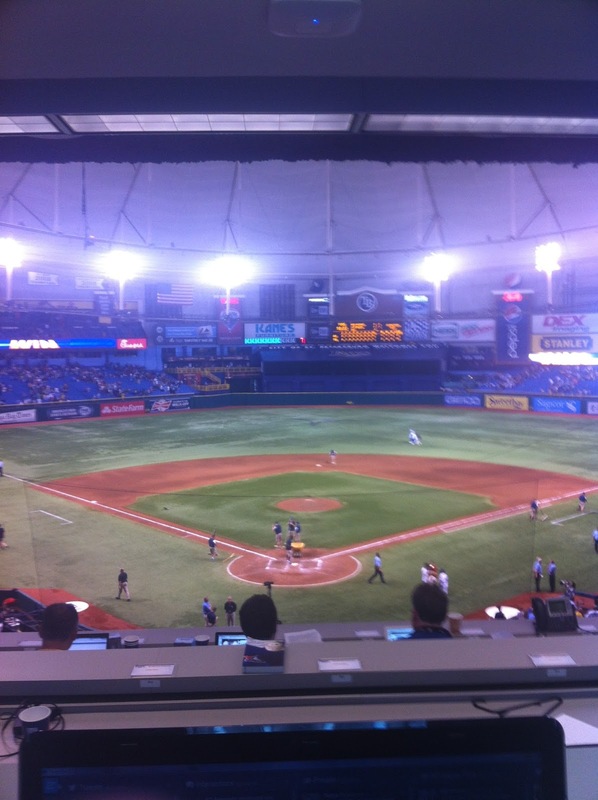 It was a good crowd at Tropicana Field last night. They gave away "Joe Gnomes". I was fortunate enough to get one. It's a neat little thing and will sit on my desk forever. There were many Giants fans at the park as well. I saw a whole lot of orange and black as I made my way through the concourse. It was almost game time so I grabbed a quick bite to eat with Alex Pavlovic of the Mercury News in the press dining room. It was a burger, nothing fancy. I was just glad I remembered to eat. It wouldn't have been such a good thing had I passed out in the press box. After all the prep work, watching BP, and standing there for Bochy's pregame chat with reporters, it was finally time for baseball. David Price vs. Tim Lincecum was the match up. I got lucky. As the game got going a gentleman to my left began to engage me in conversation. 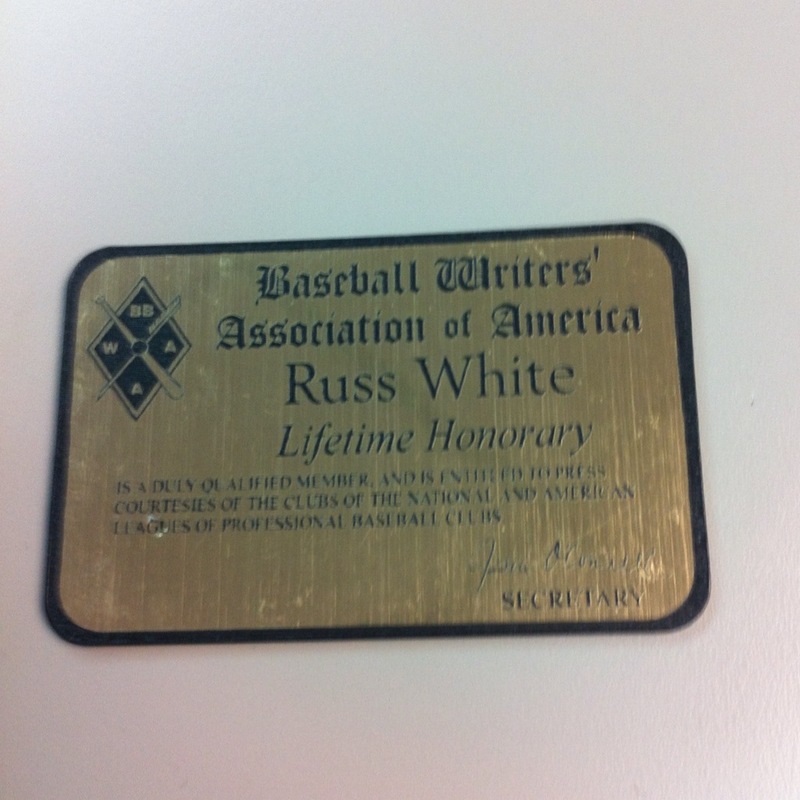 His name is Russ White and he has covered baseball for 50 years. We sat there and talked for much of the game. He told me stories of Ted Williams and Mickey Mantle. It was special. Russ told me he hadn't been to the Trop in about 9 years. He is retired and living in the area. The picture is of his lifetime pass to any MLB park. 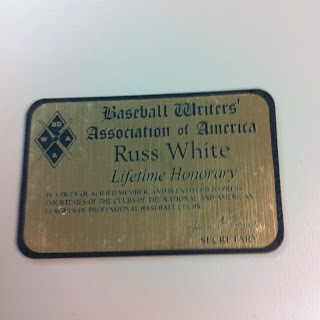 As he got ready to leave in about the 7th inning, he wasn't feeling well, Russ shared something nice with me. He told me that he had two thrills that night. He got to meet Kruk and Kuip and they signed a ball for him. The other, he said, was meeting me and talking baseball for a couple of hours. That was very touching. The feeling is more than mutual. It was an exciting game down on the field. Lincecum and Price both pitched well. The Giants managed to scratch a run across in the top of the 3rd. In the bottom half of the inning Lincecum walked Molina to lead off and he came around to score. And that was it. It stayed 1-1 for a while. The bottom of the 9th was quite entertaining. Bruce Bochy and Joe Maddon staged a chess match of players that was worthy of October baseball. But this proved to be the undoing for the Giants in the 10th. Jean Machi could not find the strike zone in the bottom half of the 10th. He walked the leadoff batter, and well you know the rest. If not, go look it up here. That was not my favorite part of the night. The Giants lost 2-1 on a Wil Myers single to left with the bases loaded. The Giants lost, but I'm going to be honest with you. It did not matter to me. I mean I would have loved to see a victory, but the day was so much more than that for me. I didn't have clubhouse access, so after the game when the writers made their way down for quotes, I was pretty much done for the night. 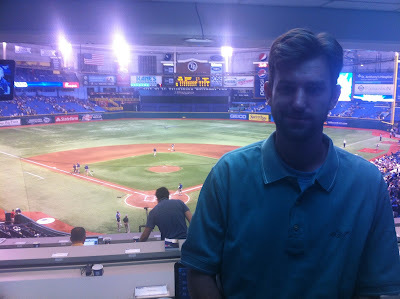 My long, strange trip through Tropicana Field was coming to a close. I snapped a few pictures, packed up my stuff and headed out. One of the greatest nights of my life had finally come to an end. What an amazing experience that was. It was one of the greatest days I have ever had in my entire life. I'm just a guy with a blog, noting more. 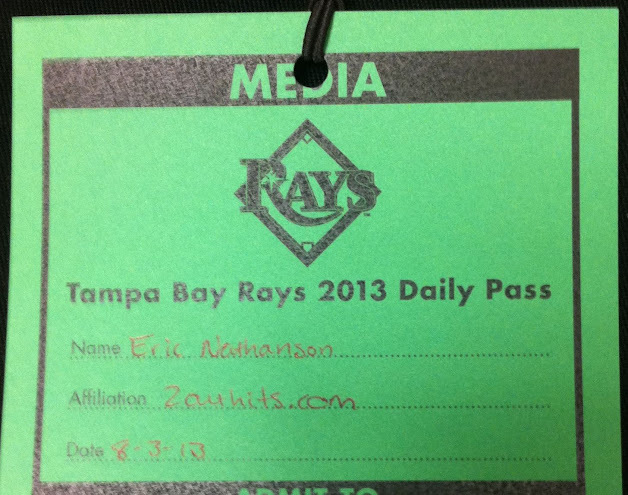 I give both the San Francisco Giants and the Tampa Bay Rays a lot of credit for the chance. Thank you to both of those organizations. I was active on Twitter all night from the park. I really felt like alot of you were with me at the Trop. It would have never come to be without you. I hope you all enjoyed my night as much as I did. It was something I will never forget. I love you guys. Thank you. Nice! Well written, nice to see you know a little baseball even. Thank you very much for sharing your evening with us. I was thinking about you the other day and stumbled up on this... I am so, so happy for you :) Keep on dreaming big dreams, Eric!